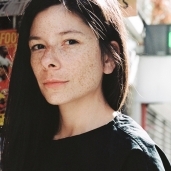 Camille Bordas is a novelist, short story writer, and translator. She was born in France and grew up between there and Mexico. She’s the author of two novels in her native French, but wrote her third, How to Behave in a Crowd (Crown/Tim Duggan Books) in English. Her short fiction has appeared in the New Yorker and Tin House, her nonfiction in Chicago Magazine and LitHub, her translations in various French publications. She teaches in the MFA in Creative Writing at the University of Florida.